480-313-0678, info@towersafety.com and rescue training courses offer authorized climber, competent climber, competent rigger, rf awareness, and tower safety climbing certification. ANSI 10.48 Competent Rigger course Tower Safety and Rescue courses offering training for the wireless cell tower certificates. Everyone should be 100% tied off, but what if you are about to perform an arc weld with temperatures from 5,000 to 20,000 degrees at 100 feet high and 110 degrees outside? Welding is not a job that can be learned in a couple of weeks and it takes many years to learn this skill. Before the job can begin, this special group of tower climbers have an additional element of risk to an already dangerous job. As a safety professional, the awareness of wearing the correct Arc welding PPE for Fall Protection is something that very few address. 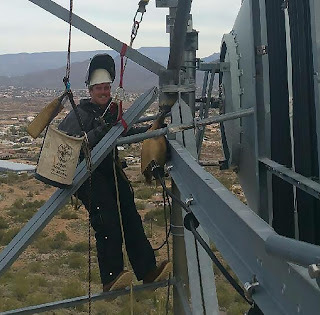 As Tower owners feel the necessity to install more appurtenances, there will be a need for more skilled welders to support the tower structures and an increase in safety concerns- Tight Working Conditions, Fire, RF Safety, and Slips, Trips and Falls. At AZ Hiking Shack in Phoenix, AZ (www.hikingshack.com), they train and provide the utility lineman their Arc welding PPE requirements. They recently outfitted Tower Safety ‘s Sunland Welding (www.sunlandwelding.com) Authorized Climber student with an Arc-rated harness, Arc-Rated Lanyards, Arc-Rated positioning strap, Arc- rated ropes, Arc-Rated anchorage straps and leather tool bags. This special equipment is required for the welders, along with fire retardant clothing, gloves, and welding helmets with a chin strap. Adding more bulk onto their tool bags is the countless amount of fire-retardant blankets to cover the coax. The average cost to outfit an individual tower climber welder is about 7k, but it’s worth every penny. Crown Castle has recently been hosting training seminars and setting the standards towards the importance of welding. The need for a rescue plan, rescue gear, and proper PPE is a vital requirement to protect the tower climber welder! 2015. Simple theme. Theme images by konradlew. Powered by Blogger.